Would some of these motorists be willing not to drive in exchange for an award? Transportation wonks typically agree that charging people for using the roads is the best way to reduce traffic. What if we paid people for not using the roads? It’s no secret that Los Angeles County has a traffic problem. According to the Inrix 2017 Scorecard, Los Angeles again took first prize as the number one most congested city in the world, with an average of 102 hours wasted stuck in traffic. 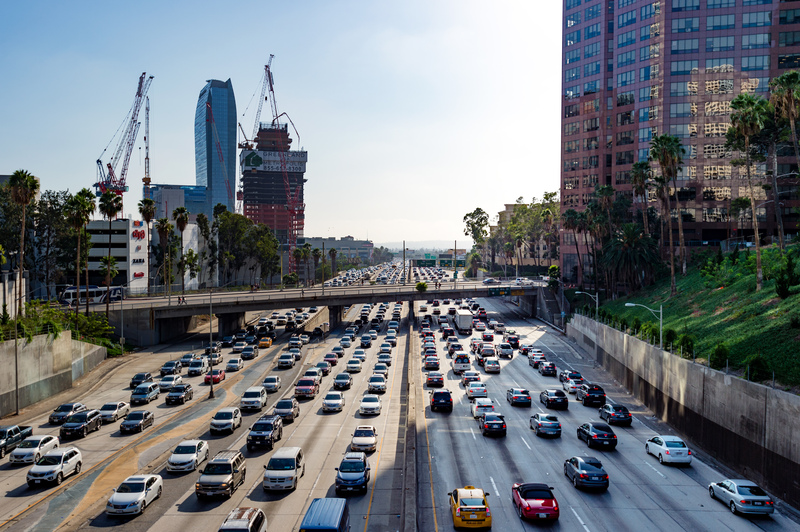 Other studies have estimated the cost of sitting in traffic cumulatively costs Angelenos billions of dollars in lost time and other expenses every year. To give Angelenos back two weeks of their lives, and reinvest those billions back into the economy, we need some extraordinarily innovative ideas. While we are investing heavily in expanding our transit system and mobility backbone, what else can we do to dramatically change the way that Angelenos get around L.A. County? What if we pay people not to drive? The concept is to pull the same economic lever as congestion pricing, but in a different direction. And it’s a lever that many – from the Southern California Association of Governments (SCAG) to the L.A. Times – are considering the value of pulling more as traffic continues to worsen and alternatives come on line. Could incentives to not drive be as effective as disincentives to drive? Could they be implemented sooner? There have been some limited pilot programs to test this concept, with public agencies rewarding customers for using their assets in the off-peak. For example, BART in the Bay Area announced that they would provide reward points for customers who choose to travel on their system during off-peak hours. In Rotterdam, between 2009 and 2012, the Dutch government sponsored a pilot program to reduce the number of peak trips on working days made by a test group in return for a monetary reward. This program successfully achieved a reduction of seven percent of trips taken during the peak. According to the L.A. Times, “A 2008 study gave drivers in Seattle a hypothetical cash sum to spend on trips, charged them tolls linked to traffic congestion levels, and let them keep money they did not spend. Their cars were fitted with equipment to monitor driving patterns.” The Georgia Department of Transportation has also launched a program that directly rewards drivers with cash or prizes for using a commute alternative. Los Angeles County could be an excellent place to develop the necessary software to test and refine this concept. Even a small reduction in the number of people driving during the peak can create enormous mobility benefits. But developing the correct project scope and software design will be challenging, particularly developing mechanisms to ensure that peak trips are actually avoided and that people are not gaming the system. So as pulling this lever appears more and more imperative, paying people not to drive could be a way to reward Angelenos for rethinking how they use our roads, and build the infrastructure to do so, sooner rather than later. Marla Westervelt works for the Office of Extraordinary Innovation. Interesting. I’ve heard of workplaces offering a small paycheck “reward” to employees who don’t drive and take up space in the parking garage, but obviously not everyone can do this. There’s incentive to not own a car, in the form of savings on insurance, maintenance, and gas. Car owners, though, only currently save money with public transit when it’s cheaper than driving the same distance. If insurance companies can offer discounts based on mileage driven, there’s gotta be some way of for the DMV to provide fee discounts or rebates, or maybe for the state to provide a tax break. I think it’s really interesting and an intriguing notion as rewards programs are certainly popular on various fronts. Maybe it’s ExpressLanes credits, maybe it’s rewards cards, maybe it’s something else. I think it’s worth exploring. Maintain the system clean and safe and some of those riders you’ve lost will consider taking Metro again!! As a former rider, I finally gave up and returned to the safety of my clean car…no homeless, filthy rodents and ghetto fabulous criminals to deal with. Interesting idea. I was thinking along the lines of making all public transportation free, subsidized by vehicle usage taxes (preferably gasoline) to provide an incentive to not drive. People could hop on and off the bus/train at will, without buying passes or scrounging for the correct change. In agreement. Since public transportation is subsidized by California tax payers by around 70%, Metro should begin a program to offer free rides to people who are paying for the system, but currently never use it. I think a program where free tap cards are sent to taxpaying Angelenos allowing free rides, once a week would encourage commuters to forgo driving one day of the week. It is a hassle to take Metro, and we would be waiting too long before improvement in the system increases ridership. I feel appealing to the civic nature of Angelenos and reducing cost would be the strongest and quickest way to encourage public transportation. Yes, it should free – which is expensive to offer – but so much easier (and not any more costly perhaps) to implement than a complicated tracking system for drivers. – Reducing the travel time when using public transit. – Removing illegal drivers (no insurance, suspended license, etc) from the roadways. The driving “privilege” is really being abused. – improved infrastructure for bikes & eBikes (My feeling is that a sizable percentage of drivers are able to physically ride, are close enough to ride and would try it if there were better systems in place. And finally – stop caving to the loud and complaining motorists who simply want more lanes, more freeways, higher speed limits. It just promotes more congestion and will make things worse. This issue won’t be solved over night, so we need to take the long view, think in the long term with baby-steps all the way to transition from a car-centric city. I understand you Al C but how can we keep the public riders from riding public transportation? I hear that question daily on my commute… I can see why ridership is down and talking to friends to try and get them more active on public transportation I get the same questions… 1)Why does Metro let homeless/crazy people ride? 2)Why do homeless/crazy people wonder on & off with all their belongings? 3)Why do people play their music so loud? 4)Why do crazy/homeless people have dogs with them & don’t clean up after their pets? 5)Why are there so few patrols on the systems & why can’t the patrols ride the entire time? 6)Why? Why? Why? Well, my thoughts on the matter is that taking public transportation for some people may be a choice but for others it’s a must and until Metro can get the “choice” to feel comfortable with the “must” the “choice” will continue to use their cars no matter the price, reward or the punishment because they will feel safer. Everyone has the right to ride public transportation because everyone is the public… Metro cannot pick & choose who ride their system that’s why people with a choice choose not to ride it.